The other evening at dinner after a viewing of Ken Loach’s new film, I Daniel Blake (a savage take on the cruelties of the benefits system in the UK–highly recommended), our friend, Melissa Fairbanks, said kind things about my blog. 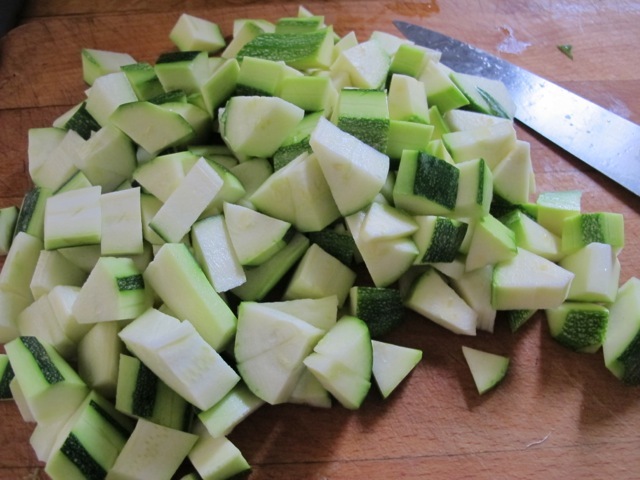 She particularly enjoys the posts about cooking from found items rolling around in the crisper, she says–bits of cauliflower for instance. 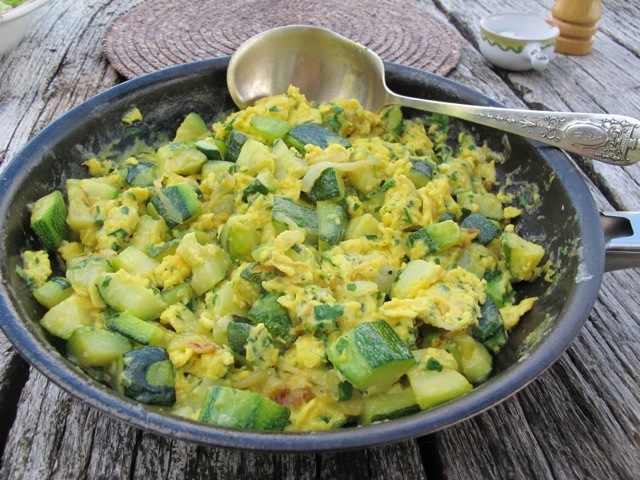 Here is one such that includes bits of cauliflower and other tidbits! You won’t necessarily have bits of cauliflower, broccoli and sweet potato hanging about in your fridge–but you may have other bits that it hadn’t occurred to you could be transformed into a delicious frittata for a tasty lunch. 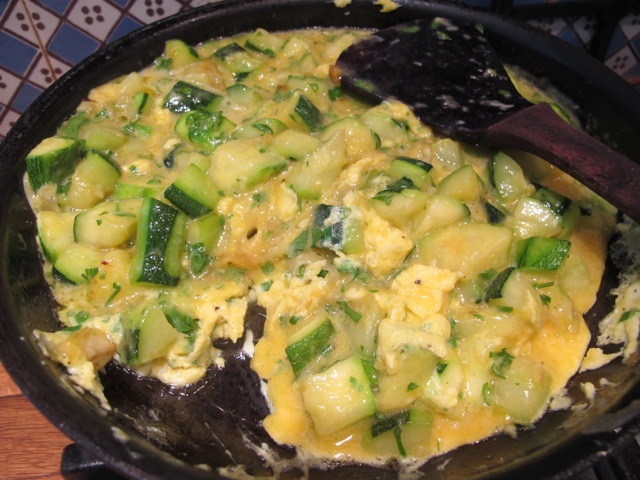 Fold the vegetables and cheese into the eggs. Immediately turn the heat down to the lowest you can. 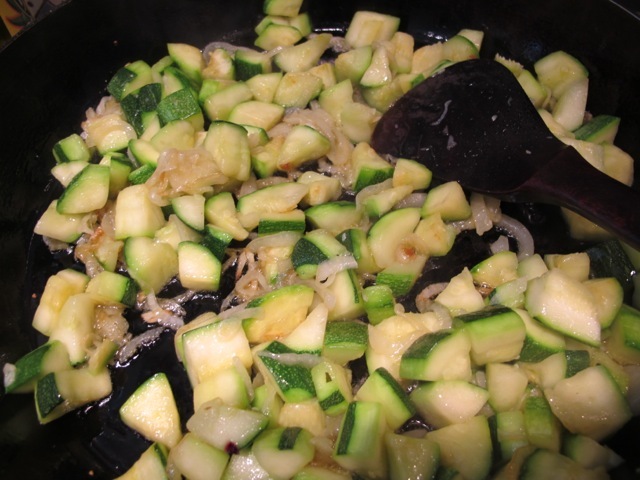 Cook for about 25 minutes–until firm with a little “looseness” left on top. Heat the grill and slide the pan under for barely a minute to cook the top and brown a little. We finished off left-over halves of stuffed red peppers with the slices of the frittata. Must check the fridge for other goodies left over! 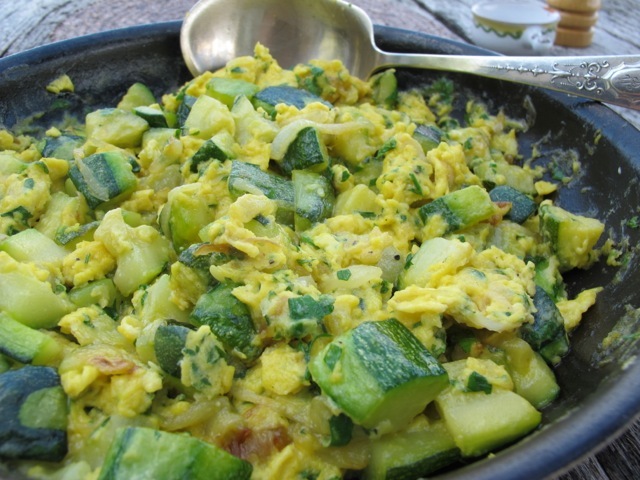 Heat a tablespoon of oil in a 10 inch pan to hot–and fold in the egg mix and spread it evenly. Up ’til late watching the Olympic closing ceremony last night–lazy morning catching up on life with house guests–sunny but mild outside–prospect of more talk and lunch under the fig tree–slices of fritatta with a green salad and a plate of brilliant red tomatoes, sliced, with olive oil and torn up basil leaves, setting us all up nicely for an afternoon siesta. Patience is the extra ingredient that makes the difference between dry and moist frittatas. 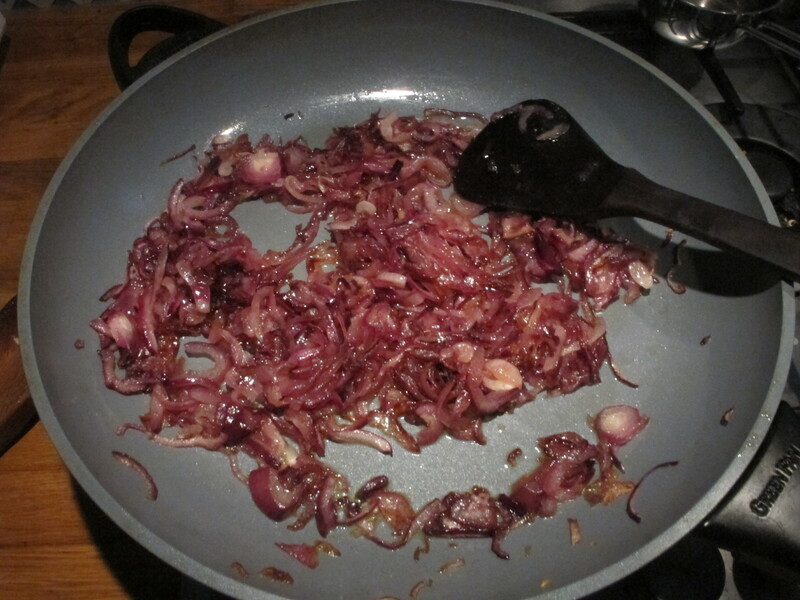 In this case patience to melt the sliced onion slowly and not to rush the cooking of the omelette. A simple classic frittata from one of my favorite old cookbooks: Marcella Hazan’s 2nd Classic Italian Cookbook. 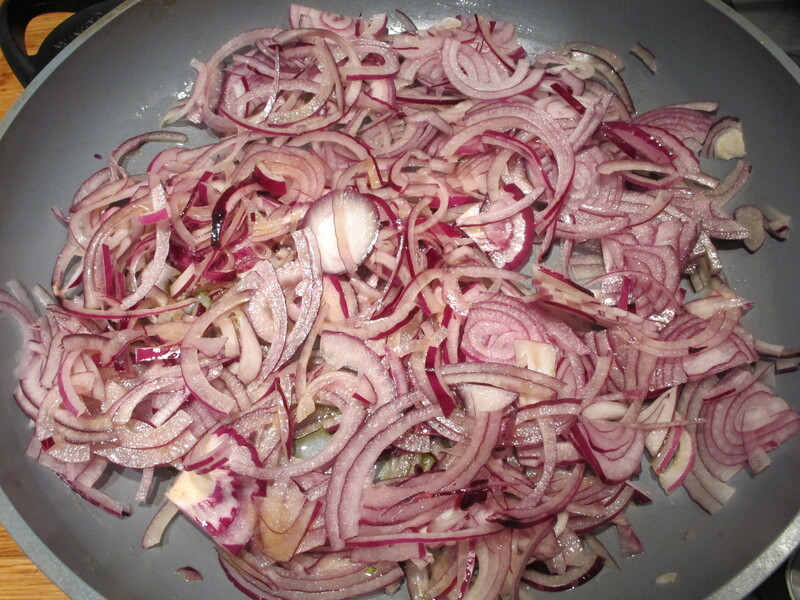 Heat the oil in a large frying pan and add the onion. 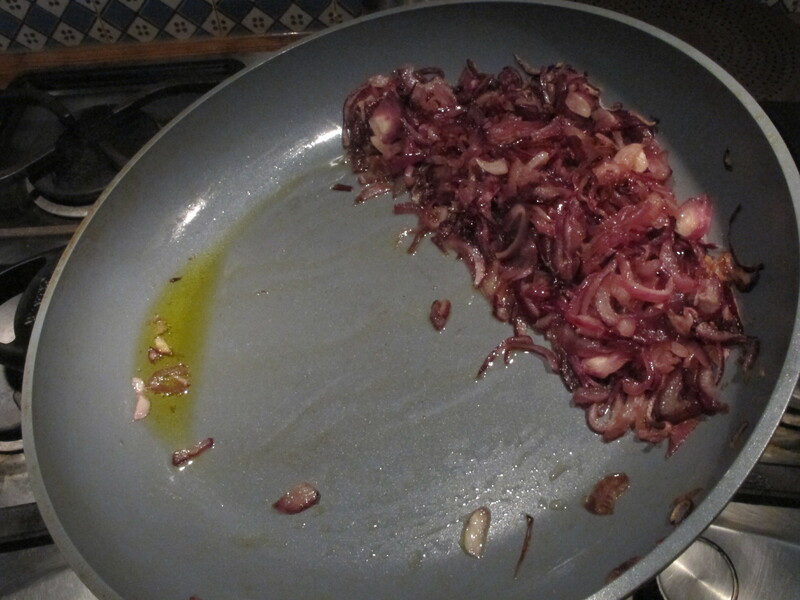 Sauté over a low heat until the onion starts to caramelise and that pleasing scent wafts over the kitchen. Turn off the heat and prop up the pan at an angle to allow some of the oil to drain off. Choose a 10″/26 cm pan that goes under a grill to make the omelette. Spoon out the drained oil (probably about 2 spoonfuls) into the pan. 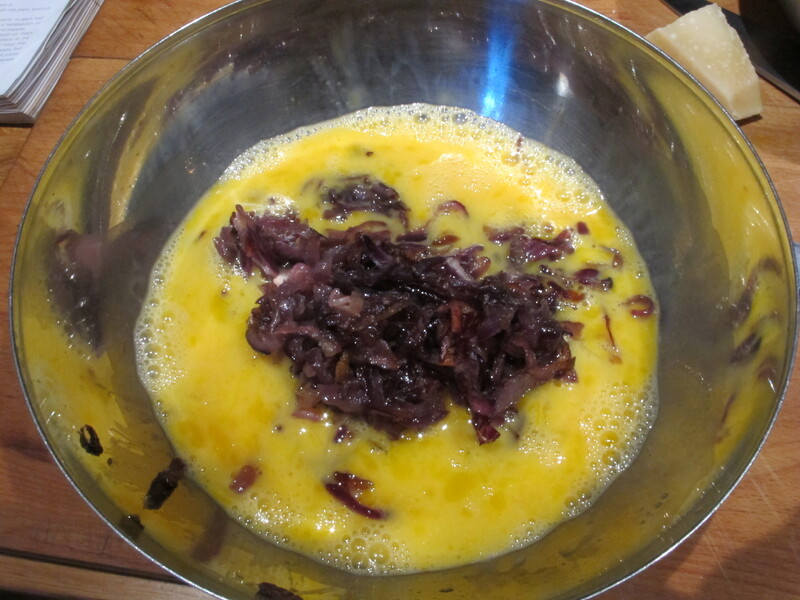 Add the cooled down onion and parmesan to the egg mix. 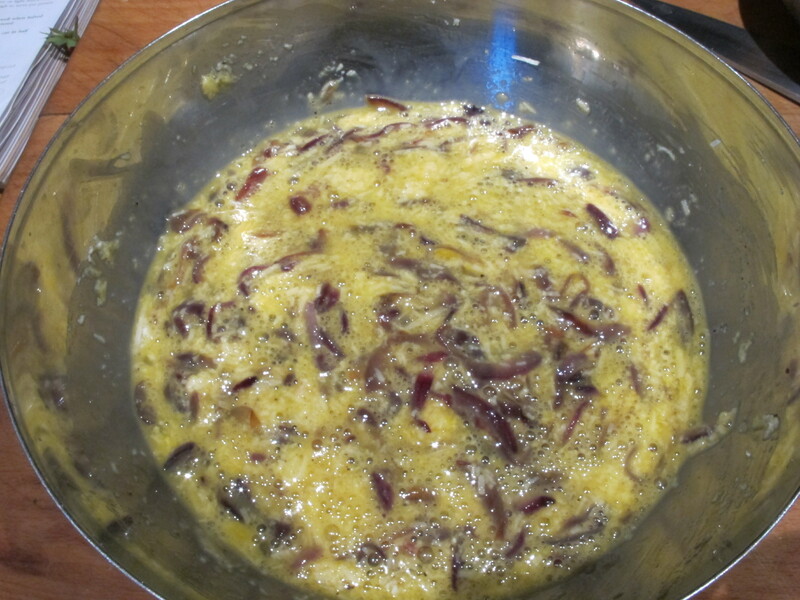 Add the eggs and spread the mix out evenly in the pan. Turn the heat to the lowest (use a heat diffuser or two if you need to) and cook for about half-an-hour. Heat the oven grill to hot. When there is just a pool of loose egg mix left on top, place the pan under the grill for about a minute. The top should be lightly colored. 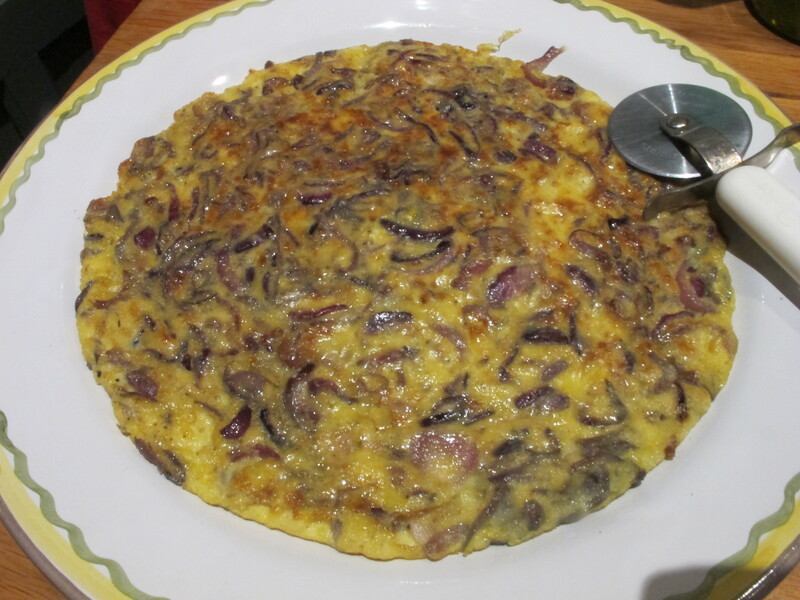 Ease a spatula under and round the omelette and slide it on to a serving plate. …Meredith says, as she comes into the kitchen from the courtyard, clutching a plastic flower pot with 4 eggs nestling at the bottom. has been keeping her ‘laying’ spot a secret since she ended her brooding marathon a couple of weeks ago. 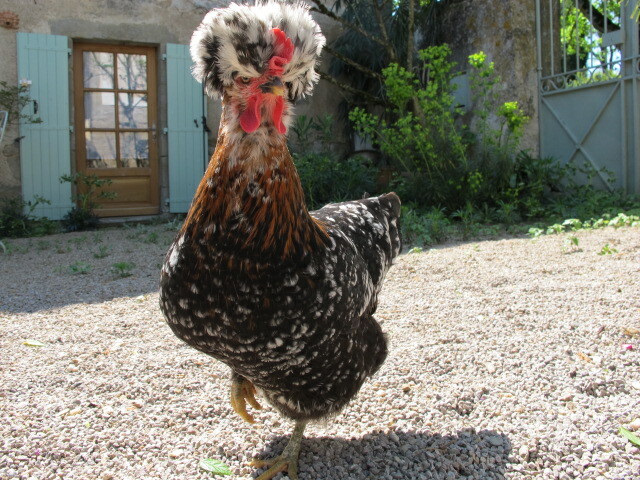 She’d sat on potentially fertile eggs brought over by our neighbour Flo for well over a month–to no avail. This instinct to hatch out the young chicks is impressive, but borders on the obsessive. In the end–fearing for her well being (she barely took time out to eat)–Meredith gradually reduced the number of eggs available until there were none and our hen resumed her other instinct–which is indiscriminate weeding in the garden. We began to wonder where she was laying, since there was no sign of an egg in the little hen house, one of her usual dropping zones! 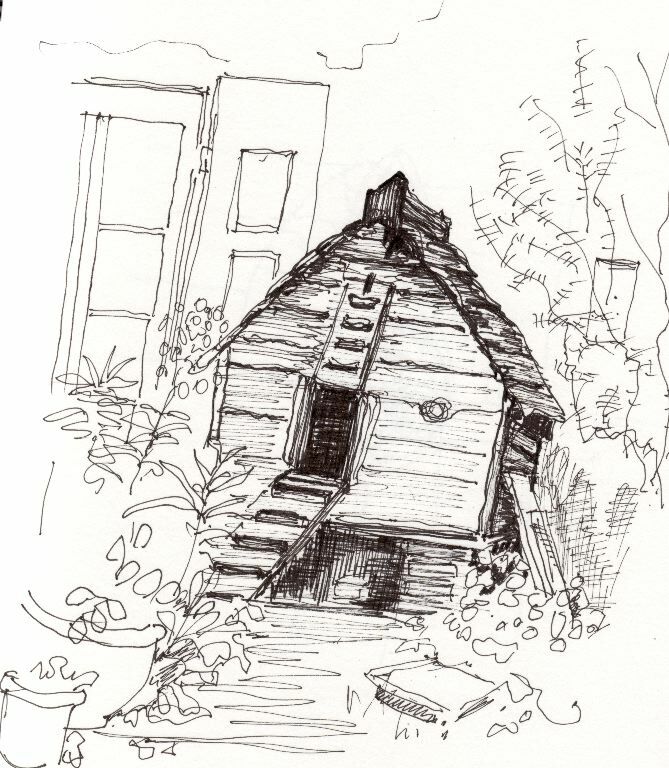 The pigeonnier, on the corner of the courtyard, is where three visiting hens, parked with us over the winter, had done their laying. They are now happily relocated a few miles up the road, but Madame Arcati hadn’t forgotten! Heat your omelette pan gently before adding the oil or butter. It should be hot when you add the eggs. Add a little salt and pepper and a pinch of the herbs. Add the egg mix and cook over a high heat. With a wooden spoon tack round the circumference of the egg mix, releasing a little of the liquid each time to build a quilt-like texture to the cooking omelette. Take the pan off the heat when you have a creamy and scrummy looking item that looks just cooked. Fold it over as you like, sprinkle extra parmesan over it and serve immediately. A green salad is all you need with it. * Madame Arcarti is named after the meddling medium from Noel Coward’s play Blithe Spirit–played so memorably in the film by Margaret Rutherford.